Shipping container homes and structures are increasingly becoming a thing in our generation thanks to the strength, durability, affordability and sustainability of the recyclable materials. They are almost readily available around the world and even cheaper near the ports. As people continue to venture into this new way of building, I look at some of the projects that have utilized shipping containers so far to create functional and comfortable spaces around the world. The Grillagh Water House is a shipping container home designed and owned by Architect Patrick Bradley. Located in Northern Ireland near the town of Maghera, this home’s design was inspired by Frank Lloyd Wright’s The Falling Water. It stands as a sculpture deep in the farming lands while still managing to complement and blend well into the site. One of the most interesting features of this residential building is the upper level that cantilevers over the lower level as it extends towards its end with a balcony surrounded by steel fins to sunshade the interior. The upper level accommodates an open lounge with breathtaking views beyond the landscape while the lower level has more intimate and private spaces including a bathroom, boot room and bedroom with a sliding door. Using 24 shipping containers, the architects designed one of the first truly mobile shipping container homes of this scale for Puma. It’s a stack of three levels of containers which have since been shipped to various destinations internationally. Two full retail spaces cover the lower levels, while the second level houses offices, press are and storage. A bar, lounge and event space with a large terrace occupy the top level. The building has been designed as an assembly of independent containers which are disassembled and encased in panels to prevent windows from shuttering during shipping. When they arrive at their destination they are assembled back to make this 1,100 square metre building. This structure located 40 kilometers south of Tel Aviv in Israel provides building offices, technical facilities and an events space at the Port of Ashdod – one of Israel’s largest cargo ports. Project architect, Sivan Joseph, explained that inspiration was drawn from how containers were stacked in the cargo port and the architects wanted to extend the narrative with a little bit of playfulness to differentiate the project from the surroundings while managing to accentuate the recreational function of the building. The playful approach taken in this project was to angle one of the containers at 30 degrees and slot a staircase inside for circulation to the upper levels. 4 containers make up the lower levels while 2 more on the upper level accommodate more offices above. Korean firm AnL Studio designed and completed the construction of an observatory deck located in Songdo New City, Incheon, South Korea. The structure which was an initiative of the Mayor of Incheon City utilizes three containers inched at angles of 10, 30 and 50 degrees to create an observatory where visitors go to watch the sunset over one of the largest harbours in Korea. The Mayor’s initiative looked to find unused containers that would later be used to create public spaces across the city. The nature of the ground level being too low inspired the leaning of the containers at the three angles, visitors can then ascend the stairs inside each container to go up and watch the sunset at higher and numerous viewpoints. Commissioned by K9 Ventures – a venture capitalist firm with special focus on technology companies, this tech incubator located in Palo Alto, California, was designed to encourage startups to leave as fast as possible. According to the architects, CHA:COL, the incubator needed to be used intensively by startups, yet for short periods of time. The brief required the architects to fit the container inside a warehouse located in the peripherals of Palo Alto. The space was required to be a skeleton of what normal incubators are, to discourage incubated startups from staying longer. The container is supported by external space surrounding it inside the warehouse, which also is as bare-boned as possible. The owner of the biggest organic farm in Shanghai, China, wanted to transform his farm from a workers’ place to an integrated workers’ and consumers’ zone where a natural lifestyle would be promoted. The activities of the people working in the farm and the visitors were linked through a shipping container homes complex developed by architecture firm Playze. The building complex accommodates a main reception, lobby, VIP area, new offices and an existing warehouse where fruits and vegetables produced at the farm are packed. Containers were chosen for their affordability, sustainability and strength with local bamboo used for indoor and outdoor flooring. The location of this project, Antarctica, required for a sustainable building that would also be easy to disassemble. The design solution by the architects, Bof Architekten, was for 134 shipping containers that would define the usable spaces as well as act as the structural system. The extreme conditions in the Antarctic featured low temperatures and very powerful winds necessitating the shipping containers to be clad with an insulated aerodynamic skin consisting of metal panels. The skin was tested and optimized for this purpose. The lower level houses laboratories, storage, technical space, CHP Unit, a garage and a workshop. The second level has 24 single and double rooms, a kitchen and dining room, library, fitness room, OP room, offices and a lounge while the third level accommodates an air conditioning system and a terrace that can be used for various scientific experiments. The two tree house is among shipping container homes disguised with prefabrication wherever possible. Located in Jerusalem, Israel, the architects wanted to preserve the existing trees so they integrated the two trees within the perimeter of the house. Prefabrication of the container was chosen instead of masonry work so that the trees can be preserved. The container features timber cladding, light roof over steel ceiling, stone work, and decks which complement the site. The pine trees sunshade the timber cladding from the harsh sun. Architect Jim Poteet designed this house for artist Stacey Hill who wanted a garden retreat, playhouse and guesthouse for visiting artists within the artists’ community in San Antonio, Texas, USA. Floor-to-ceiling glass doors and windows were added to the shipping container, including a heating and air-conditioning system, a green roof, a small sink, shower and toilet. Spray-foam was used between the exterior walls and interior bamboo for insulation to protect the interiors from gaining too much heat hence creating thermal comfort. The whole container home is placed on a base made from recycled telephone poles. The green roof features a number of plants with the overhang at the back planted with cacti. Tsai Design Studio developed this classroom for Vissershok Primary School located in the rolling hills of Durbanville wine valley on the outskirts of Cape Town. The children who school here are from underprivileged communities and farmers living in Du Noon. The project features learning, growing, playing and gathering areas. The learning area inside the container is sun-shaded by the large roof above it which has also been raised to reduce heat gain. Knowing the difficulty in ventilating shipping container homes, cross ventilation is achieved through a series of colourful windows on either side of the container. This house in Brisbane features 31 shipping containers spread over three levels with a floor area of 506 square metres. It’s one of the largest shipping container homes in Australia. It has lots of open spaces and quality finishes used to achieve an interesting industrial effect. It’s a four bedroom house all ensuite with garage space for 2 cars and the master bedroom occupying the whole upper level. Other features include a mezzanine reading room, a pull-out wall bed in the rumpus room, an art study, workshop, gym space, water tank and saltwater pool. Its interiors are so elegant that it sold for more than AUS$1.4m in about one year after it was completed. Cast in the port city of Savannah, Georgia, this container home by Artist and Designer Julio Garcia features two shipping containers creatively worked to come up with a small but posh home and studio. The container side-walls were cut out and separated by a gap which was filled with a wood-framed floor and shed roof to create an open area that doubles as the living room and is larger than other spaces. The interior of the house has a contemporary feel and look intentionally designed for by the artist with large windows that bring in daylight. The designer opted not to repaint the shipping containers as a reminder of their industrial past. The house was first designed to be an exhibition space for the Shelburne museum in Vermont. However, today the home is a gallery for contemporary design. As one of the model shipping container homes, it consists of three shipping containers. The house is located inside a large steel shed that reduces heat gain. Two bedrooms with ensuite washrooms, a study and a kitchen make up the spaces provided by the containers. Through winding roads these shipping containers found their way into a wooded environment and were designed to make a weekend getaway on an 11-acre piece of land in a forest in Santa Cruz Mountains. The containers were left in their industrial state on the exterior to reduce costs while the interior walls were covered with gypsum board and custom hard-wood floors refinished using apatong plywood. The end product of architect Fenster’s planning is this neat pile of six shipping containers with light-filled glass “spine” running through the centre to create one of the most beautiful shipping container homes in the area. This 3 bedroom home in Lille France consists of 8 shipping containers stacked on top of each other to make a 240 square metre home next to an expansive field. The exterior is painted red while the interiors have white walls with red columns. The roof acts as a sun shading element to prevent the containers from overheating while the tunnel created in the middle is a good incentive for breezes which allows air flow to cool the containers. Each container has one end totally removed and replaced with large windows for daylighting while the containers doors have remained intact to provide shade, privacy or protection against natural elements. On the lower floor a garage, storage, kitchen, dining and living area with an open floor layout was accommodated. The second floor has three bedrooms, bathrooms and office. This art studio consists of two shipping containers side by side perched over a 2.7-metre foundation wall/cellar to create two floors. The painting studio is located in the lower level that is accessed via a wide staircase which takes advantage of a high ceiling. The upper floor provides a more intimate work and sitting area for the client whose house is adjacent to the 84 square metre studio in Amagansett, Long Island, New York. The architect explored with the Peralta family the possibility of designing an affordable home 20 minutes away from the city of San Jose in a vast piece of land in Costa Rica. The client wanted a place to call home where they could enjoy the natural landscape and be with their horses. The option to use shipping containers to design and build their home was a suggestion from the architect that they willingly accepted because it meant they could be debt free due to the affordability of shipping container homes. The result is a home built from two containers adjacent to each other providing spectacular views. A roof between the two containers creates a sensation of openness while at the same time providing cross ventilation that is sufficient so they never have to turn their air-conditioning on. Decameron furniture store is located in Sao Paulo in a rented commercial space. The client wanted a quick, viable and affordable solution to a showroom that would have ample space to showcase their furniture. The use of containers meant that the structure and systems would be easy to design. The predetermined measurements of the containers also made it easy to stack them onto each other to two stories. The client is a photographer and some of his requirements were a home that can be turned into an office whenever needed and with lots of daylight. The architect, Maria José Trejos, designed a home composed of 8 shipping containers with a central double-volume space and openings at the top for cross-ventilation. The house which is located in Escazú, San José, Costa Rica, is filled with daylight making it unnecessary to use lighting fixtures. One of the containers was strategically placed at the very top to create a terrace and a porch below it housing a bedroom and studio. The complex was designed for the ballooning hub of talent in the Dubai Design District. The architects, Ibda Design, designed the series of structures over a period of 8 months carefully manipulating the shipping containers in order to maintain their industrial form as much as possible. The incubator is designed to host a variety of events including exhibitions, collaborative works and displays in order to encourage the growth of art and design in the Middle East. Landscaped open spaces in front of every building compliment the industrial nature of the architecture. All structures have ‘wind towers’ that catch high-draft wind and funnel it towards the onsite courtyards hence passively cooling the structures. Full-height windows and high sidelights passively light these shipping container homes. 14 standard shipping containers were used to come up with this home for architect Matt Mooney who also helped design the house together with local architecture firm M Gooden Design. The home spans two stories with 3 bedrooms, a large open-plan layout living area, 3.5 bathrooms, a kitchen, dining room, 2 car garage and a storage space. A small penthouse with roof access is accommodated with several covered porches next to the main living areas. A large roof deck also acts as a relaxation space. The home is modern and the steel material of the containers has been left exposed in the interiors to give the interiors some industrial feel. Cove Park was developed as a cluster of 6 containers where artists can go to get inspiration for their writing or paintings and drawings in a serene environment situated next to a water feature known as Loch Long. Each container has a cubicle with ensuite accommodation and sliding doors which lead out to a decked balcony with amazing views of Loch Long. An insulating layer of grass is used to top all the containers in this 50-acre piece of land in the west coast of Scotland. Two containers sandwich a taller common space in this project in Nederland, Colorado, USA. The architects, Studio H:T, questioned the need for excessive space and challenged occupants to be efficient with their use of space. The taller common space in between the two containers provides entry, dining, living, and a loft space above. The whole house is solar-powered and also uses passive cooling, green roofs and pellet stove heating. This is a low-tech home with each container housing typical home features separately. The first container has storage space, the second houses kitchen amenities while the other three both have a bed and bathroom. The interior finishes are minimalist with sliding glass doors that allow the occupants to gaze over amazing views in the horizon. The roof of this home in Texas, USA, absorbs some heat to warm the spaces. Cooling happens when wind passes between the container and the corrugated steel. 32 shipping containers were used in the expansion of the California school adding up-to 929 square metres of classroom space. It was the first large eco-friendly shipping container homes project in the region and it consists of four classrooms, several restrooms, a science lab, an art studio, a virtual library, student lounge, an auditorium, and administrative offices. An auditorium that is two floors high consists of 9 shipping containers. The project has four free standing buildings that took a little under 100 days to build. 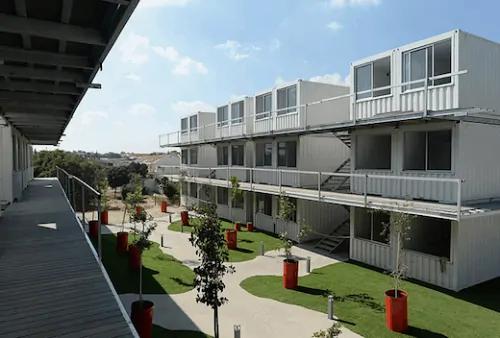 In about 7 months, and using 36 shipping containers students built this village that gave life to 150 apartments in Sderot, Israel. The shipping container homes interiors were covered in drywall and painted white while the exterior of the containers was left as industrial as it gets. The project comprises three separate structures. Each apartment is fully self-contained with a functional kitchen, living area, a bathroom and bedroom. 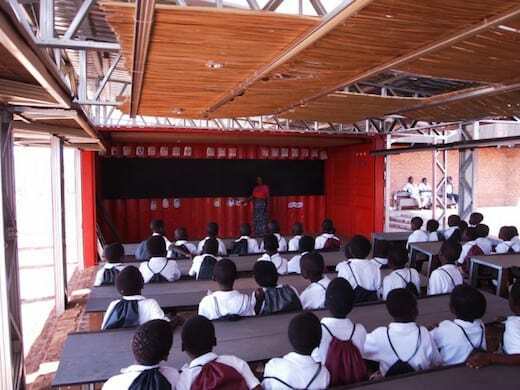 An architecture firm known as Architecture for a Change (A4AC) designed this school and community centre in Malawi for use by the less fortunate in the community. The firm which is based in Johannesburg, South Africa, designed the school as an independent entity with a rain water harvesting system and solar power array. The building which also doubles up as an adult training centre educates children and has two classrooms and a large central courtyard. Some sides of the containers were removed and louvres installed to aid in natural ventilation. A client that visits the Southern Colorado often wanted a family retreat designed for his family and guests. Architects from Tomecek Studio designed this container home using one standard 12-metre container with 6 other 6-metre shipping containers. The shipping container ends were structurally reinforced and enclosed with additional walls built on site. The walls have been custom-fitted with high performance glazing. The home has two bedrooms, two bathrooms and a guest quarter. This unit made from one shipping container provides its dweller with a ready home no matter the destination. It has been fitted with all the necessary live-and-work features that the dweller may need. The metal walls have been cut and extruded to demarcate major spaces including a work, living and storage space. When travelling the extruded sub-volumes are pushed back into the container where they interlock to allow standard shipping like a normal container. The interiors and sub-volumes are fabricated entirely out of plywood and plastic coated plywood, including all fixtures and furnishings. Despite the shipping container homes unit being designed for mobile purposes, it could easily be configured for permanent residency. This shipping container house in the dunes of Amagansett, New York, was built such that 4 shipping containers at the ground level accommodate all four bedrooms. The other two at the top house the kitchen, living and dining room. The exterior of the containers feature Cyprus siding together with fiber-cement and energy-efficient windows with low-E glazing. Architect Sebastián Irarrázaval designed this home for an art collector and his family in Santiago, Chile, from 5 standard 12-metre shipping containers and six 6-metre containers. The presence of the Andes Mountains in this location is felt strongly both visually and physically. There was need for negotiating the slope while making sure wind runs smoothly through the house to prevent any need for mechanical cooling. The result is one of the best shipping container homes with its ends emerging out from the rocky hills to provide spectacular panoramic views of its surroundings. Designed as a resting place away from the hustles of the city, this is one of several shipping container homes in San Francisco, Cordoba, Argentina. It is characterized by a high quality environmental context. In an L-shaped layout at the ground floor, the architect managed to accommodate the main entrance, kitchen and pantry in one container with the laundry, bath, fireplace, workshop and warehouse in the other. The central courtyard-like space created acts as a public space as well as a living room. A blind façade conceals the rooms from the street for privacy reasons. Rooms open to the courtyard and enjoy maximum natural lighting and ventilation through the day. The windows consists of high performance aluminum and double glazing. This house makes use of wooden surface to add warmth and elegance to the two shipping containers used to construct it. This single-family home has facades that have been insulated to prevent heat gain. The whole house is made from recycled materials with the shipping containers acting as the home’s main framework. The house features a large living room connected to a spacious kitchen, a master bedroom, three smaller rooms, bathroom, utility room and a passive cooling chamber. In addition to this the house is also fitted with a large greenhouse adjacent to the kitchen and a large south-facing terrace. The client needed an extension of his residence which was also being used as the office. With a successful business, the original residence wasn’t enough and the architects at Building Lab were called to provide a solution. The architects designed a separate home office using shipping containers in order to keep the costs low. The shipping containers gave the house a new somewhat enclosed courtyard as well due to the layout; making it among the best shipping container homes that achieves an extension so the client can separate his office from his home for better productivity. BigSteelBox unveiled a series of shipping container homes for Liquefied Natural Gas (LNG) workers who will live in the houses until the company finishes carrying out new liquid gas projects Northern B.C. Each container has two units that have a bedroom and bathroom. Each unit is fitted with a bed, air conditioning, flat screen TVs, computer workstations and stainless steel appliances. Floor-to-ceiling windows bring in as much daylight as possible. Containers were favoured for this project due to their sustainability, affordability, strength and increased durability since the liquid natural gas projects may run up-to 2020 according to the Canadian government. Three shipping containers wide by two shipping containers tall gives you the main living space in this home which has an immense amount of daylight courtesy of the large expanses of glass incorporated on the containers. A concrete floor, large glass panes, sliding doors, stainless steel, beams and columns characterize this elegant home with modern finishes. The extremely detailed fanciful interior design makes this one the top shipping container homes around. Two metal shipping containers are stacked side by side to form the first level while two more containers are stacked on top of the bottom containers so that the whole arrangement forms a cross shape. She thought shipping container homes are much fun. Together with an engineering firm, NCK, the home was put up in a day in Sainte-Adèle, Quebec, Canada, after two weeks of cutting the metal containers for openings and window placement areas. The exterior was clad in unstained hemlock spruce because Claudie didn’t want to paint the house every year. The interior walls of the house are painted white. Floors are finished in polished concrete with radiant heating on both levels. Built in Anyang, Korea, this building stands as a bold yellow and black landmark in Hakwoon Park just next to the riverbank. Inspired by shipping container homes, eight shipping containers are shifted and cut along a 45 degree angle and combined in a fishbone pattern generating a large arrow-like volume lifted three meters over the landscape. Two containers are angled upward and downward to reach ground and sky. The container structure is an art school that allows it’s users to be visitors, spectators and actors especially during the APA2010 public art program. An outdoor apparel company called Aether opened its first concept store in San Francisco made of three shipping containers stacked upon each other to form three levels which are accessible by an interior stair. A cantilevered lounge enclosed by glass on the second level can be seen from the street. ProRail, the company in charge of the railway network in Netherlands decided to transform waiting stations to make them feel safer and more supervised, albeit informally. Borrowing from shipping container homes, three containers are suspended in the air to create a roof. One of the containers contains necessary installations for lighting fixtures, while the other has storage space. The third one is opened at the bottom to create a double-volume transparent waiting space. The fourth container which is flipped upwards forms a tower which contains a wind-vane at the top and a clock. Among the amenities that further improve the project are washrooms, Wi-Fi, floor heating, railway TV and Art. Printing office Drukta and mailing company Formail both moved into a warehouse with a total floor area of 4,000 square metres in Kortrijk, Belgium. Design studio Five AM was brought in to figure out how the two companies would share the space. 13 containers were used and effectively spaced so that the machines on the work floor were easily accessible by both companies. Colours of the containers contrast with each other and the warehouse’s concrete creating dynamic images of the two companies. Containers were also made partly visible from outside the warehouse to allow natural light through the windows into the office spaces as well as making the façade distinct and unique. Originally conceived for the 2010 World Cup, this mobile retail unit is an amazing way of how shipping containers can be used to create retail spaces. The architects designed this drive, drop and shop unit from one shipping container with the container able to laterally expand to increase its interior space. Once transported to wherever it needs to be, it is opened by pulling out the pods on one elongated side of the container to increase interior space, and opening the main entry access on the opposite side. A combination of 2 12-metre and 3 6-metre shipping containers begot this shipping container home in the outskirts of Santiago, Chile. The structure was developed as an earthquake-proof and low-cost home and built in a very small time frame. The home features thermal pane windows, internal coating plasterboard and projected cellulose insulation with the total floor area being about 120 square metres. It stands to be counted amidst large shipping container homes in the area. This container’s steel contrasts with glass to give this house an outstanding unique look. The open plan compliments an already amazing interior. 12 shipping containers form the interior rooms with each container representing a particular space like the kitchen, bedroom, etc. Large windows cut on the ends of the shipping container homes to fill the bedrooms with natural daylight.